Updating the home one grew up in is not always an easy task. For example, how do you take your mother’s kitchen and make it your own? That was the challenge facing the owner of this two-storey home in Markham. 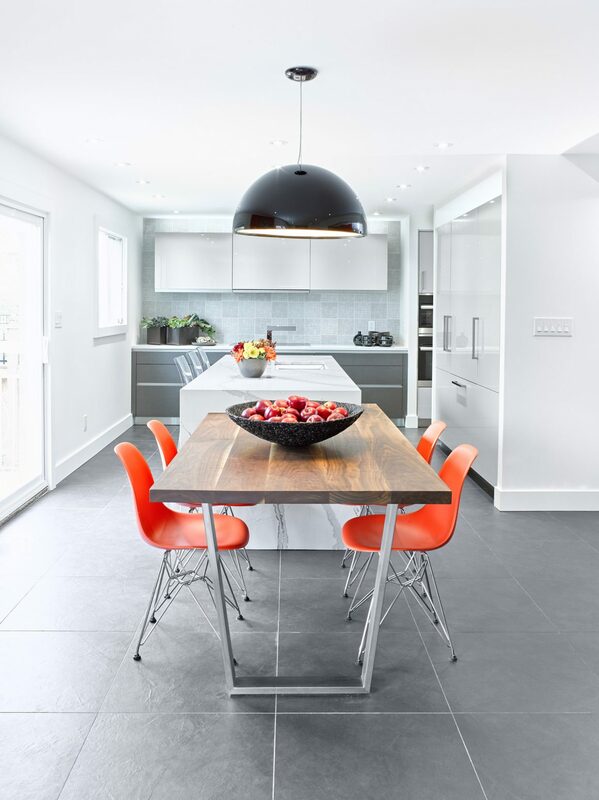 After inheriting the house from his parents, he wanted to modernize the kitchen, to make it more contemporary. 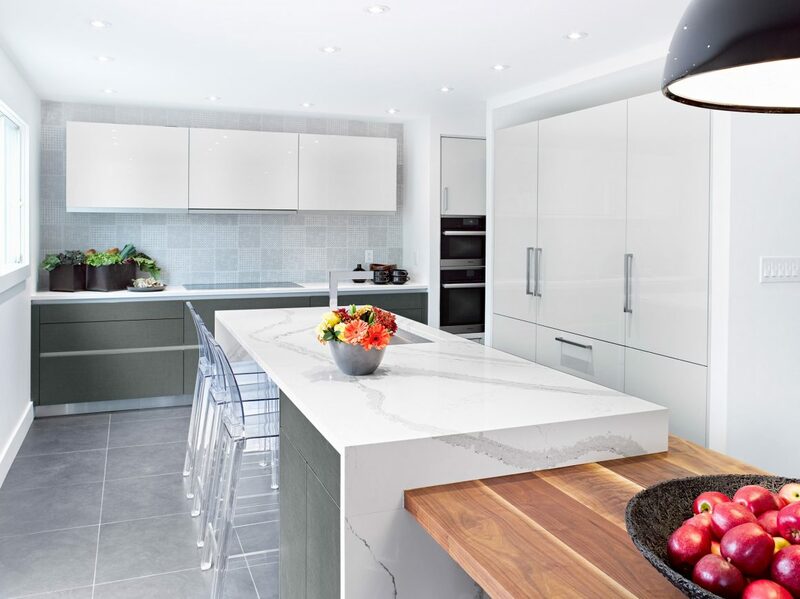 A single man who frequently hosts family gatherings and poker nights with friends, he set out to re-imagine his kitchen space. The custom walnut tabletop was fitted into the quartz waterfall edge of the island. He turned to designer Linnea Lions of Binns kitchen + bath design. 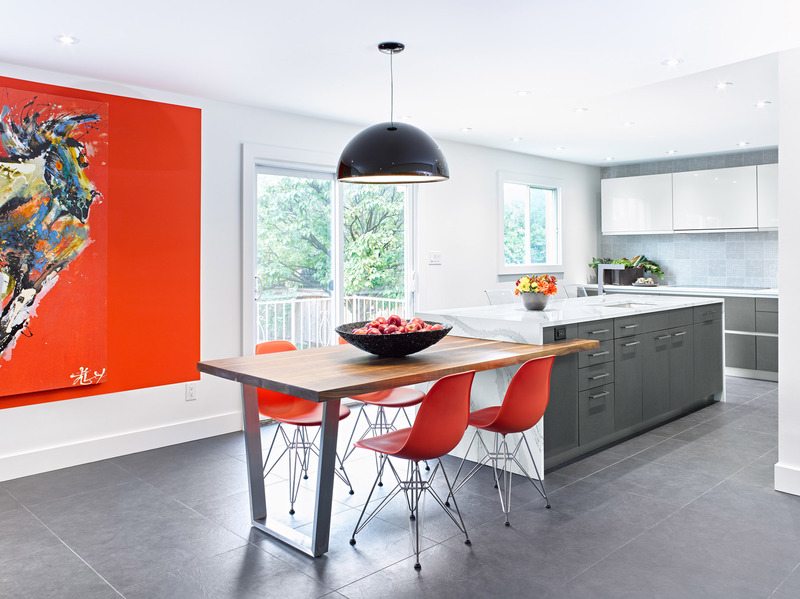 Together, they transformed what was a dated and divided eat-in kitchen and living room into an open-concept space that showcases colourful art, a masculine style, and a little modern-day tech. The floating cabinets along the back wall are equipped with drives, which flip; the front panels open and close automatically. The back wall is clad in square tiles that come in various designs. It’s also quite different from what it used to be. “I had a pretty blank slate,” Lions says, explaining how the process began. Aside from wanting to modernize and open up the enclosed kitchen, the only item on the owner’s “must-have” list was an island. “He wanted an island, a big island, with a sink,” Lions says. Then, he wanted to add a table. But even after knocking down a wall, which expanded the kitchen area, the space to navigate around these two items would be tight. “My solution to that was to integrate the table into the island in a nice and unique way,” Lions explains. 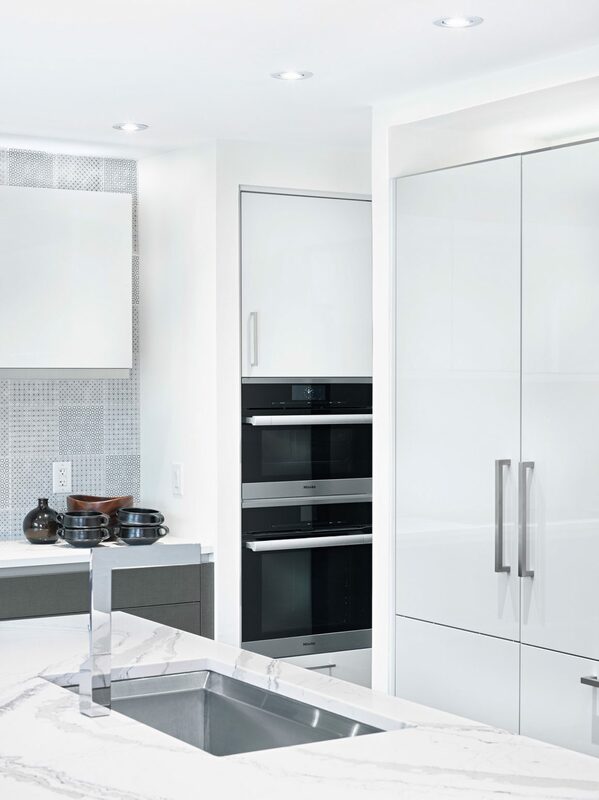 A convection oven and steam oven are mounted in a wall off to the side of the main kitchen area. 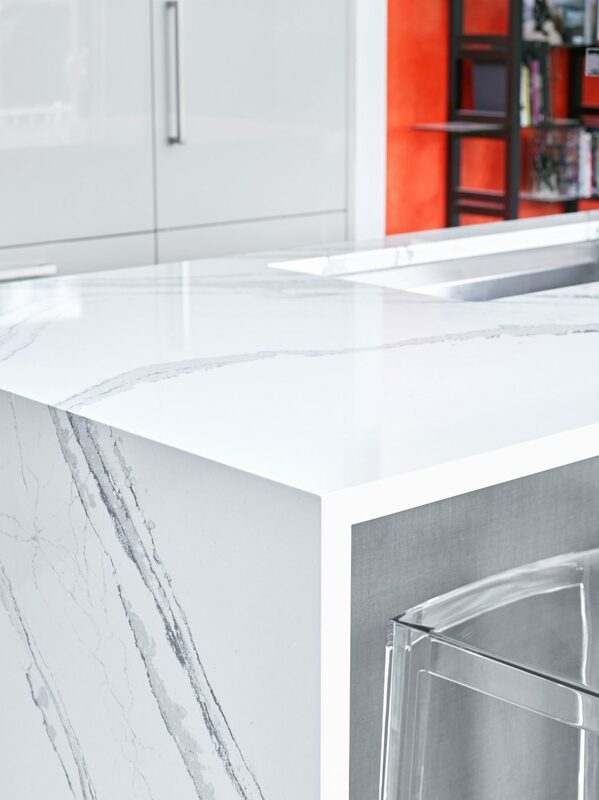 Lions also liked the way the features of the two materials – the warmth of the wood and the cold crispness of the white Brittanicca quartz from Cambria – play off each other, while the outside edge of the table is supported by a custom-designed stainless-steel leg. Then the owner asked about adding a touch of colour, mentioning he had a large abstract painting that might work in the space. The artwork features bold blues and blacks along with white and yellow tones, set on a bright orange background. The designers coordinated it with the molded Eiffel chairs on each side of the table. 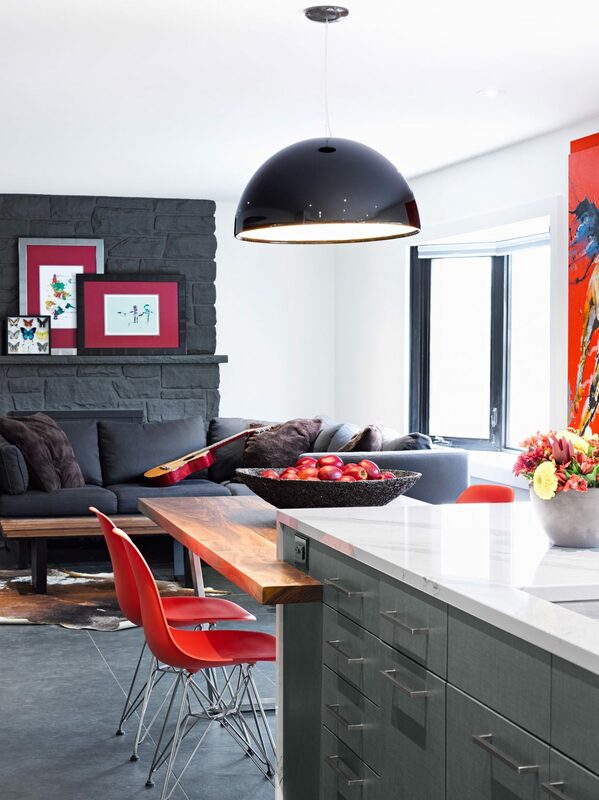 The kitchen now opens directly onto the living room, which was given a small update when the stone fireplace surround was painted a dark charcoal grey for a masculine look. Using colour in this way also makes it easy to update the space – by changing the art and switching up the chairs – without too much expense or trouble, she adds. Lions also gave the space a contemporary masculine style. This included painting the stone fireplace in the now-adjacent living room charcoal grey, and integrating all the appliances within the new cabinetry, including the range hood. This is also where the little dash of modern tech comes in. 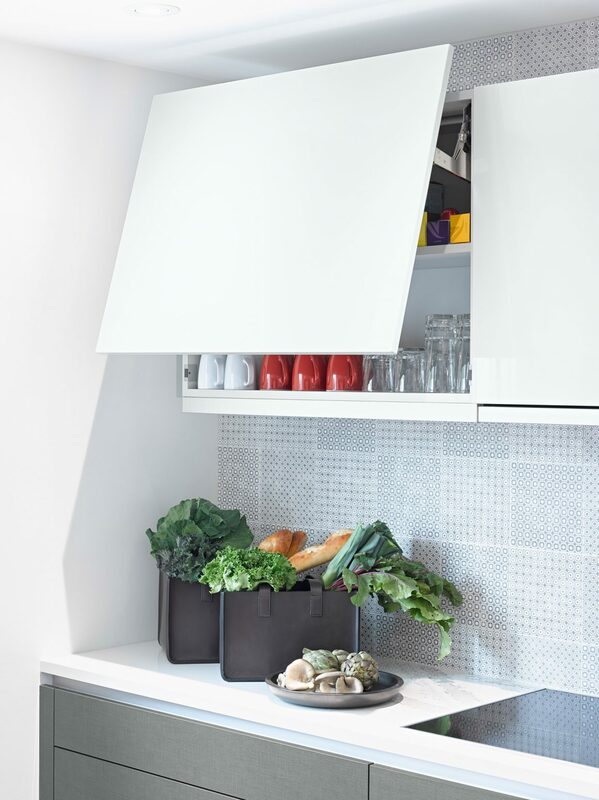 To incorporate the range hood in the row of floating cabinets along the back wall, Lions had to design the storage space using three 36-inch-wide panels. 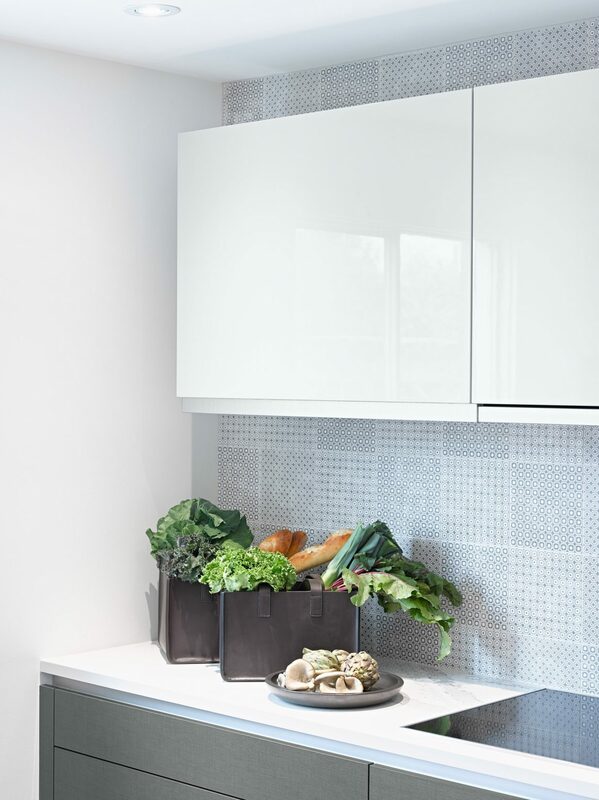 The central panel houses the range hood, while the two outer panels are cabinets, each with matching 36-inch-wide doors that are finished in high-gloss light-grey lacquer. Because of the width, the cupboards do not open with side-swing doors. Rather, they are fitted with flip-up panels equipped with drives for easy opening and closing. By pushing the cabinet slightly inward, the mechanized drive opens the panel. To close it, a button located on the inner frame is depressed, which automatically brings the panel back down. These custom cabinets are sold directly through Binns kitchen + bath design.